Join Us!!! We are looking for someone to help us cover Lesotho basketball. Please send us an e-mail. 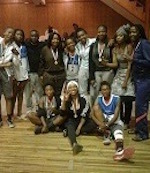 2017 Lesotho Basketball Association (LBA) Annual Summer Slam Charity Tournament that took place at Lehakoe Recreational Centre over the weekend saw Foxes males' team from Zimbabwe being crowned the champions in the male category while Phoenix Flames ladies from South Africa are the females' category champions. Foxes earned themselves a chance to sit on the throne after beating the tournament last year's champions- Bokamoso 'Rebels' with 71-65 in the finals on Sunday night and the Rebels were forced to take position two. In the ladies category, Bokamoso ladies 'Dolphins' became the runners following their 61-35 painful loss against the champions- Phoenix. Phoenix were the defending champions in this category. The champions in both categories were blessed with gold medals and 'A Framed Summer Slam Charity Tournament Jersey' while the runners-up went home with silver medals. Talking to this paper, Bokamoso Basketball Development Program, Faku Masupha hailed his teams for reaching the finals in both categories. 'Even though in the male category we failed to defend our title, I am proud that we reached the finals and that was enough to show how determined we were to stay the champions,' said Masupha. According to Masupha they could have done much better if not for players' school work commitments which he said affected their preparations. He added that other countries' teams are likely to have advantage over Lesotho teams due to the fact that they raised under academies and have international exposure. LBA assistant spokesperson and coordinator, Mookho Ntebe declared that the tournament was fair and competitive. She said the organisers were satisfied with teams' attendance from outside the country. The tournament was scheduled for Friday but that was disturbed by the rainy unfriendly weather. On behalf of LBA, Ntebe gave thanks to the tournament sponsors. She also congratulated the champions. Apart from creating platform for teams to test powers against each other, the tournament collects gifts for charity and Ntebe said they haven't yet decided which orphanage to donate the collected items to. Lesotho national basketball league 2016/2017 defending champions, Bokamoso South coach, Nkhethuoa Makhorole, said her team is looking forward to successfully defend their league title regardless of the challenges they endured after losing some of their key players during the off-season. Makhorole told this paper that the absence of players like Nako Mofube was a huge loss to the champions. She said Bokamoso is under pressure because it is obvious that each team will be willing to topple them from the throne. Therefore she said they really needed the service of such players. Players like Mofube had to leave their former teams to join their school teams following a recent demand by schools that they needed all their players back. Mofube was one of the best small forward for Bokamoso and he is now playing for his college team, Lerotholi Polytechnic (LP). Makhorole made a firm vow that even though they are enduring such huge losses they are ready to stand the pressure. So far Bokamoso has played two games against Limkokwing University of Creative Technology (LUCT) and Khube-State in the ongoing 2017/2018 national league and managed to win all games. Mokhorole said that was good and promising start for her side. 'LUCT and Khube-State showed great improvement but our encounter against these teams really couldn't give us clear picture of our standard this season. We are looking forward to face our big rivals like Khubetsoana All Stars (KTA) and after that we will then be able to rate our performance,' added Makhorole. Lesotho Basketball Association (LBA) public relations officer Rats'olo Molupe also told this publication that they were happy with the recent performance shown by the teams in the league and that the association is proud to see that almost every team had recruited their respective ladies teams to join the contest. He confirmed that the standard of the league was growing as all teams had beefed up their rosters with quality players during the break. The Lesotho Basketball Association (LBA) will next month host a tournament for women teams at the National University of Lesotho (NUL). According to LBA spokesperson Ratolo Molupe, the tournament whose main purpose is to uplift the basketball spirit among ladies and inspire them to further take part in officiating, is open to all women teams in the country. We are expecting all women teams in the country to take part in the tournament and not only those who registered with LBA, including high school clubs. Registration fee is M250 per team and deadline is February 21, said Molupe in an interview with Public Eye on Tuesday this week. He noted besides promoting the sport, the event also seeks to motivate women to take part in officiating roles such as refereeing. Molupe further said the tournament, which normally takes place during Womens Month in August, would help put focus on ladies teams. This is unlike when we hold a tournament for both men and women teams at the same time, where after men teams play most people who come to watch the matches, including the players themselves, just go away as if its break time instead of watching the women playing, he explained.